Baseball diagram is the simplest way to explain Baseball details. Plenty rules and terms may startle a newbie. Using visual method to explain the meaning of each term, play or strategy gives a clear understanding. ConceptDraw DIAGRAM software extended with the Baseball solution is an amazing tool for producing and presenting baseball diagrams. Extending ConceptDraw DIAGRAM software with the Baseball solution you receive a set of libraries, templates and samples with fields, positions, basic diagrams examples. This is not frame you have to work in, this is a start point for your creativity. Feel free to create your own object and templates from zero point or changing existing ones. Sample 1. 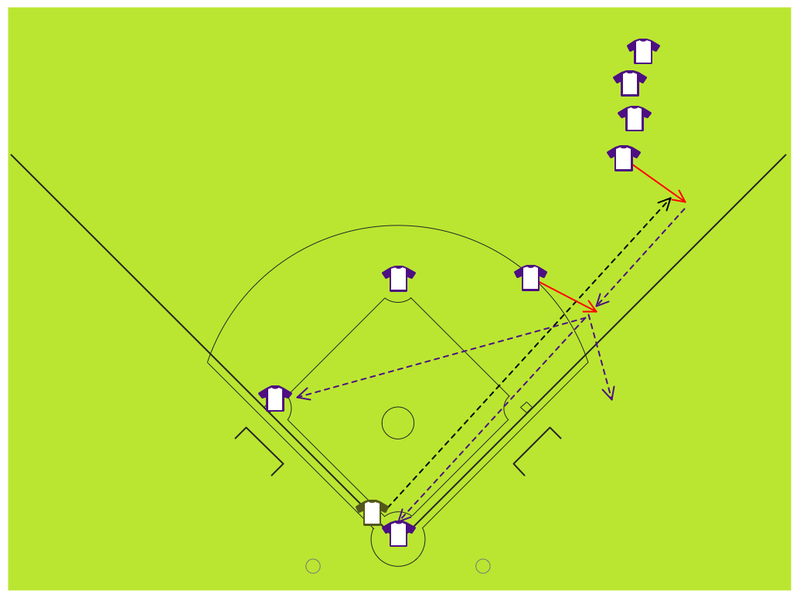 Baseball Diagram – Fielding Drill – Hit the Cutoff. This diagram was created in ConceptDraw DIAGRAM using the "Baseball Positions" library from the Baseball solution. An experienced user spent 15 minutes creating this sample. The sample you see on this page was created in ConceptDraw DIAGRAM using the Baseball Solution; it demonstrates a portion of the solution's capabilities and the professional results you can achieve. All source documents are vector graphic documents. They are available for reviewing, modifying, or converting to a variety of formats (PDF file, MS PowerPoint, MS Visio, and many other graphic formats) from the ConceptDraw STORE. The Baseball Solution is available for all ConceptDraw DIAGRAM or later users. Extending ConceptDraw DIAGRAM v12 software with the Baseball solution from the ConceptDraw Solution Park you receive a complete set of libraries, templates and samples allowing to draw baseball diagrams in seconds. You can start from a template, change positions and get ready diagram in some clicks. ConceptDraw DIAGRAM v12 software extended with the Baseball solution delivers a set of samples depict the most popular baseball diagrams, and libraries and templates allowing you complete this set with all diagrams you need.A complete set of predesigned fields and positions make drawing baseball diagrams as quickly as with pen and paper. Drawing baseball diagrams using ConceptDraw DIAGRAM v12 software extended with the Baseball solution saves your time, and adds more value to your work. You can easily convert vector drawing to a popular graphic format and then post it to your blog or site. There is no problem to add your logo or text copyright, or use some text comments to make your diagrams unique and recognizable. ConceptDraw DIAGRAM v12 software extended with the Baseball solution delivers samples with diagrams of the most popular plays in baseball. You can complete this set modifying any sample. All you need is to drag and drop objects to depict another play and then save with the different name. Feel free to add text label with the play name directly to your document.